The Musketeers tells the story of an elite group of soldiers who protect the king at any cost. 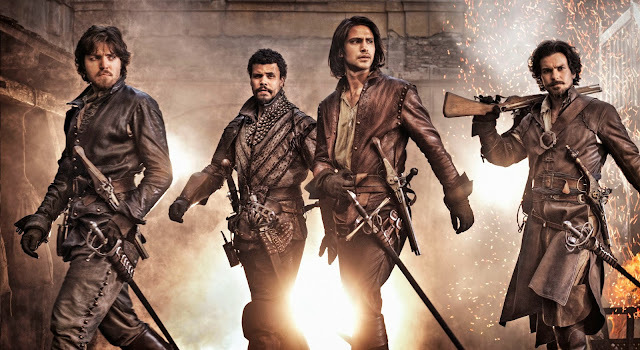 D’Artagnan (Luke Pasqualino), Athos (Tom Burke), Aramis (Santiago Cabrera) and Porthos (Howard Charles) are brothers in arms, fighting for what is just regardless of personal risk. Writer and creator Adrian Hodges said: "I'm thrilled we can finally release the first image since wrapping filming on The Musketeers. I hope the picture gives a good idea of the look and intensity of the Musketeers themselves, and a hint of the excitement of each powerful, dramatic and action-filled episode." The accomplished cast also includes Peter Capaldi, Tamla Kari, Maimie McCoy, Hugo Speer, Ryan Gage and Alexandra Dowling as well as a multitude of guest stars. The 10-part drama (10x60-minute) for transmission in early 2014 is a BBC Drama Production for BBC One, co-produced with BBC America in association with BBC Worldwide.